Webster will also field house teams at the 12U and 16U/19U levels. The 12U team will be coached by Kaley Ostanek, former RIT hockey player. Teams will focus on skill development, friendship, sportsmanship and most of all fun! 3/15/08 Webster 14U girls take 1st place in the GLGHL 14U Team skills competition, and placed 3rd in the GLGHL 14U Playoffs. In the double elimination format with 7 teams, Webster lost to the 3rd seed Camillus, won against the 5th seed Niagara, and then defeated the 2nd seed Skaneateles. Webster lost to the 1st place Hamburg Hawks (4-1). Great work girls! WEBSTER GIRLS ARE STATE CHAMPIONS! 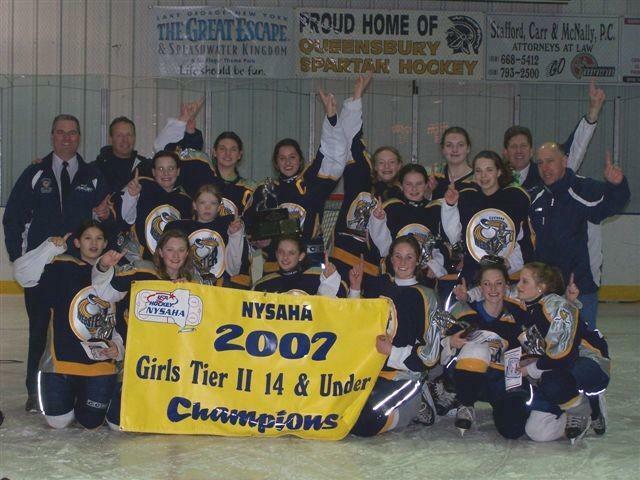 The 2006-2007 14U Tier II State Champions! The 2006-2007 12U Tier II State Champions! The 2006-2007 16/19U GLGLHL Champions! The 2006-2007 Queen of the Rings 14U Champions! 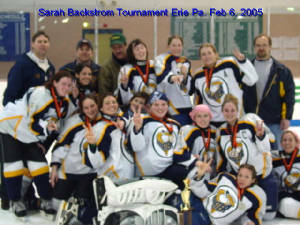 The 2007 Sarah Backstrom 14U Champions! Since its inception Webster has focused on player and team development. Nothing new to Webster, the focus on teamwork and player development leads to success: winning games and championships, as well as individual growth. We have the area's only girls beginner program, going into it's third year, as well as the only "Try Hockey" program for girls of all ages. We have a girls house program that develops skills and sportsmanship in a fun environment! Webster 14U Team wins GLGHL 19U Playoffs! Webster 14U Takes Erie Championship! The Webster Girls 14U Team took 1st place at the Sarah Backstrom Tournament in Erie, PA earlier this month, winning all 4 games (25 goals for and 0 goals against). 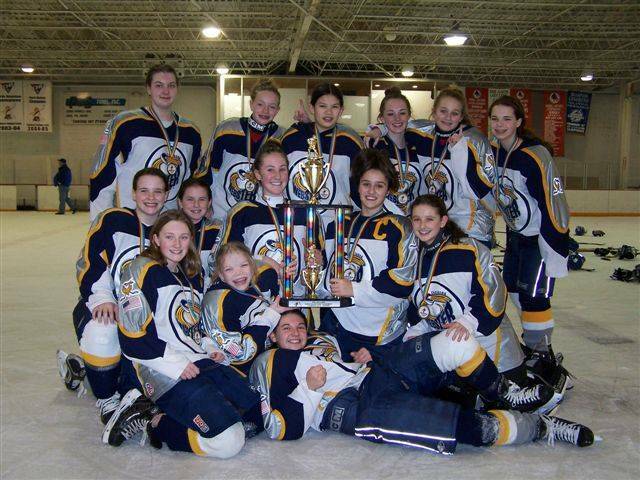 The 2006-2007 Webster Girls 14U Travel Team was crowned Queen of the Rings in Toronto in August. The team took the A Division 14U championship in its first series of games for the season! 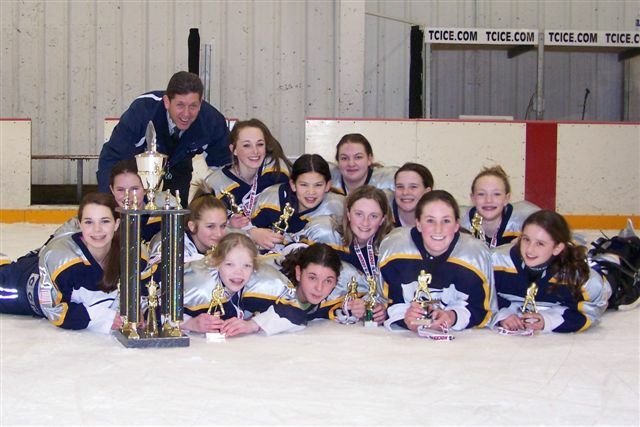 The 2006-2007 Webster Girls 12U Travel Team was also victorious, taking the B Division 12U Championship at the same tournament. Congratulations Girls! Webster Girls Hockey is offering a girls-only development program for the upcoming season. Webster coaches, skills development PLUS scrimmages! CLICK HERE for more information or to register! The Webster Girls Hockey Program needs all types of hockey equipment. This equipment will be used for the Girls Try Hockey program. Donate your outgrown equipment to a good cause! See John at the Webster Ice Arena or contact Gini (218-5256; gini@rochester.rr.com) or Michelle (787-2633; Michele.thompson@eds.com). Pads, helmets, skates, sticks, pants, gloves etc We need it all! Our COACHES: Committed to player development and team development. They motivate, teach and encourage! Our PHILOSOPHY: Teamwork, conditioning, improvement and fun! Our ORGANIZATION: Webster Youth Hockey is committed to providing the same great opportunities for girls as it does for boys. Our GIRLS: They play with fire, they play with skill, and they play as a team! Webster Youth Hockey is home to one of the fastest growing girls hockey programs in New York, the Webster Lady Cyclones. For the 2008-2009 season, Webster is proud to field a 16U TravelTeam, a 12U House Team, and a 19U House Team. All teams play in the US-based Great Lakes Girls Hockey League. Girls hockey is always non-checking! The emphasis is on skill, speed and teamwork! Dave Ames will coach the 16U House Team, Kayley Ostanek will coach the 12U House team. The 19U coach will be announced after evaluations.